Here's an interesting ball pen, the BIC Atlantis with easy glide technology. I decided to try the blue, but this comes in standard issue black as well. The pen does have a very smooth, easy glide and seems to move more like a rollerball's gel ink that a ball pen's oil-based ink. It's smooth, with just a tiny bit of smearing that really isn't noticeable on either paper or your hand. But as with all ball pens, I still have the desire to wipe extra ink off the tip even though their was none. The tip is 1.0mm and billed as a medium point, and while it doesn't see to be that that wide it does look like a good width for writing. I like the look of this pen, the grip has just a touch of give so my fingers don't start to ached from clutching a chunk of hard plastic. One interesting feature is that the pen twists open at the back near the clip rather than at the front near the tip. Retractable, refillable, nice design and color--don't know what the connection to Atlantis might be (I'm hearing Donovan warbling away in my head now) but if you see this pack you might want to try it out. I like the way the Easy Glide Bic pens write, but I do find a lot of smearing and especially some globbing with them. Because of this, I don't like to use them on sticky notes where I may rub my finger over the text and smear it. 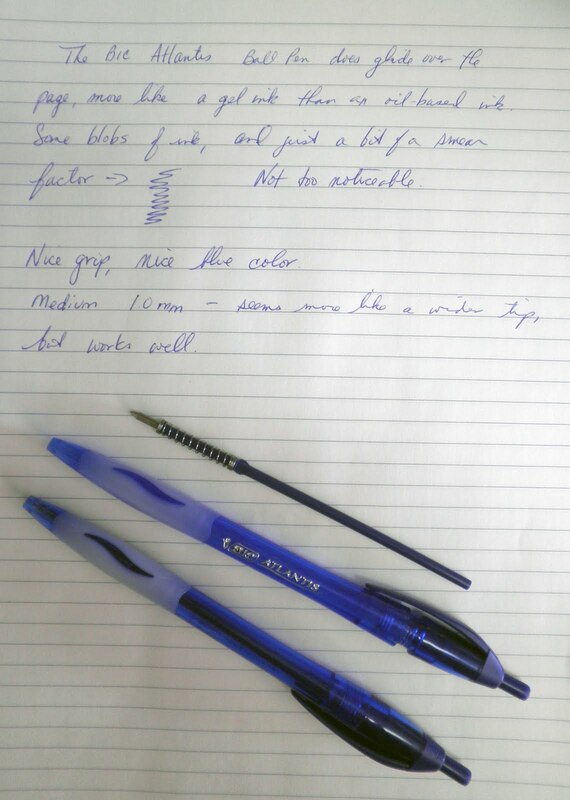 Hi there.I like BIG for Her pens which is also Easy glide but it doesnt say refillable.Could i buy easy glide refill at stationery store? If you mean BIC for Her pens, they are not refillable.